Growing up in India, the cheese that we were most familiar with was the Indian Cottage Cheese called “Paneer”. I dont think there is anyone who doesnt love Paneer except my daughter. I figured most of the Paneer dishes in Indian restaurants were cut in cubes and she didnt like the way it looked! I know -how picky can a 4 year old get? So i decided to find a way to make her love Paneer. I tried grating the Paneer and throwing in a bunch of veggies like colored bell peppers, corn, peas, onions, tomatoes and let it simmer in a rich and exotic cashew sauce!!! !I also felt like I deserved to give it a name since I came up with the dish and it is one of the most ordered dishes on my catering menu. I named it “PANEER PASANDA”. 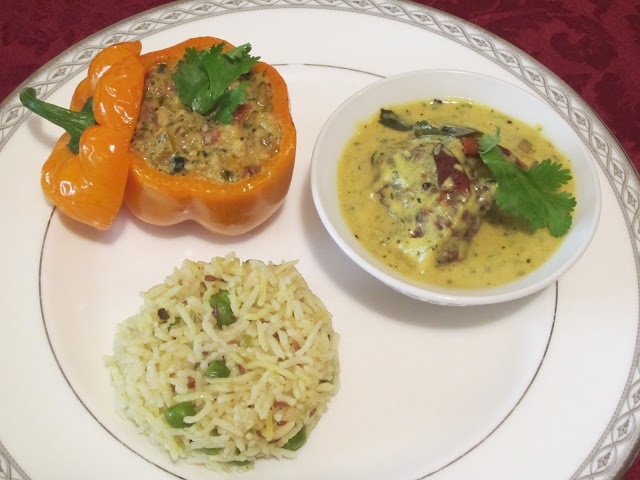 This is a click of a bell pepper stuffed with Paneer Pasanda and I made Peas Pilaf and a Punjabi Kadhi. Punjabi Kadhi is one of the most humble yet delicious yogurt based curry that I ever ate in my life! ← My Favorite Meat Substitute- EggPlant!